Art museums, science centers, parks, zoos, aquariums – these places share a common thread in that they are fully immersive environments that encourage individuals to follow his/ her/ their own path, exploring, discovering, and learning. Take the concept of immersive learning and infuse it with powerful storytelling, artistic expression, unbound creativity, and fierce playfulness. Then crank it to eleven. THAT is Meow Wolf. 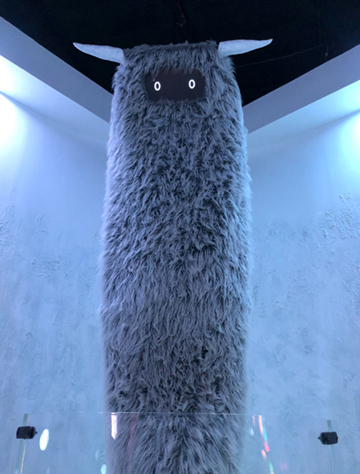 Katie and her son recently discovered Meow Wolf in Santa Fe, New Mexico. Take it away, Katie! 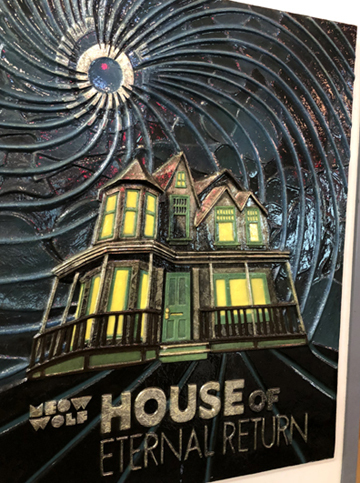 Meow Wolf: House of Eternal Return. Crazy name for an art exhibit, right? Turns out it’s not only crazy, it is a hands-on, completely captivating, artist inspired, mystery to be solved, fantastical world, storytelling experience that’s *really* hard to explain to someone who hasn’t been there. With that said, I’m going to try to explain it, because I was absolutely blown away by this place. 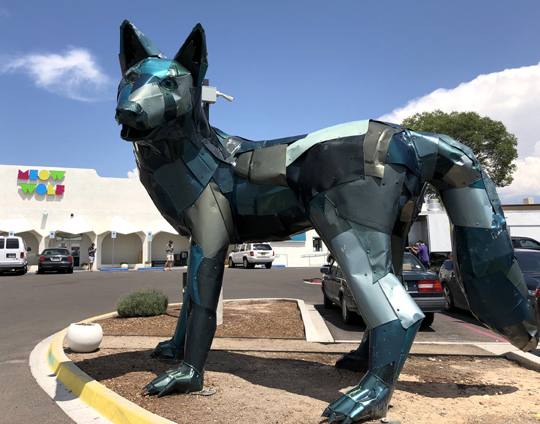 With support from Game of Thrones author and Santa Fe resident George R. R. Martin, who purchased a defunct bowling alley and leased it to the group, Meow Wolf turned the once forgotten building into a permanent art exhibit, House of Eternal Return, which opened in March 2016. 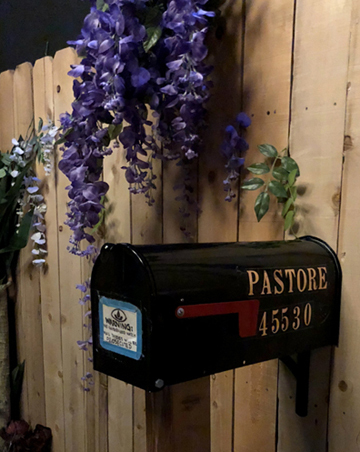 Employees working the House of Eternal Return ticket counter encourage you to touch everything, explore everywhere, and fully engage yourself within the over 20,000 square foot exhibit. You start investigating the mystery of the Selig family disappearance by finding a mailbox and reading messages written on the cards inside. The cards provide hints and clues to search for while you wander through the maze of rooms and hallways. 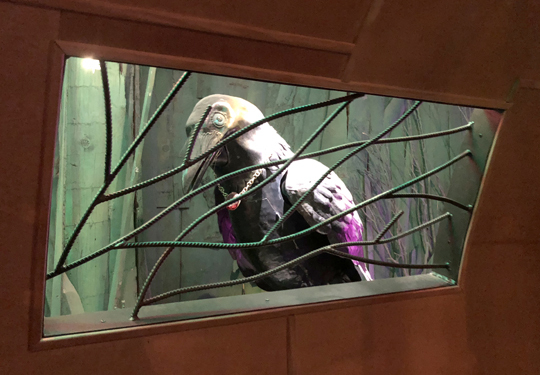 Deeper inside the exhibit, there’s a mechanical raven (another Game of Thrones nod, perhaps? ), which occasionally flaps its wings and chatters at the visitors below. 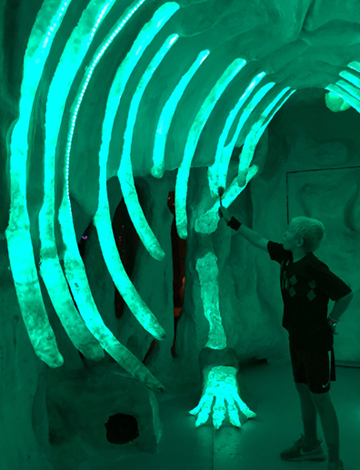 My son and I spent nearly four hours wandering through the House of Eternal Return. 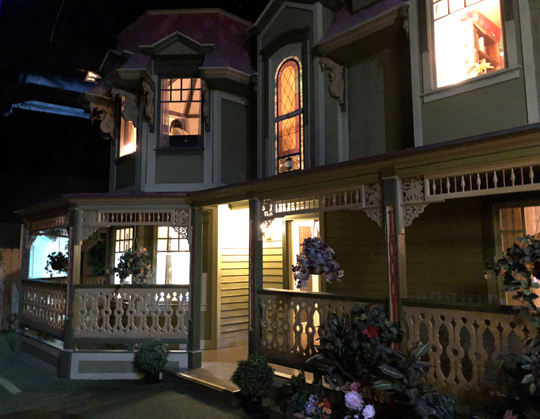 The exhibit has dozens of hidden doors and portals to unique and fascinating places, which through the story strangely connect in some weird way to each other. Crawling through the fireplace brings you to a cave where you can play music on the rib bones of a giant glowing mastodon. 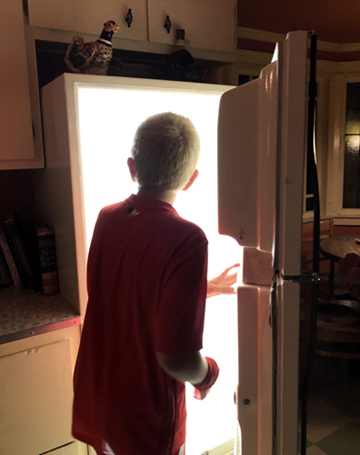 Walking through the open door of an ice machine takes you into a room full of lights and mirrors, where you push buttons to change the lights and play different notes of music. Going through the refrigerator leads you down a sterile white hallway into what appears to be a rocket ship, ready to take you to futuristic tropical destinations. There are also strange space monsters that blink their eyes at you when you walk by. Walls of fabric that reveal an ever-changing light show when you touch it (or floss dance between the wavy cloth). 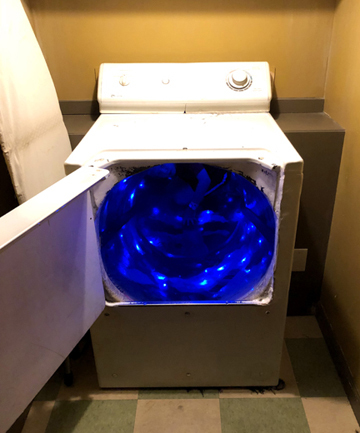 You can also try stuffing yourself down the slide portal inside the dryer, which ends in a small room with walls completely covered in laundry. For those of you wondering, yes, I did manage to squeeze my way into the dryer, much to my son’s amusement. There is another door into (or out of) the laundry room, but my son and I couldn’t figure out where it was after leaving the room. The entire exhibit is a mystery you have to attempt to solve, but honestly, I don’t believe there is one definite solution. Visitors interpret art differently, so what one person thinks is the answer, another may believe something completely different. I can’t say enough about the House of Eternal Return: it is a must-see place. This post barely scratches the surface with all there is to see and experience. Pictures really don’t do it justice because everywhere you look, there’s something distinctly different and jaw-dropping. It’s funky and fun, inspiring and incredible. 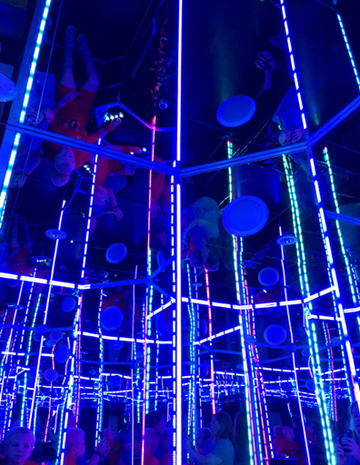 If you are in Santa Fe and visit Meow Wolf, plan on spending many hours exploring and getting lost within this one-of-a-kind immersive art labyrinth.